← What Is It about Camp Friendships? <strong>• Overemphasizing sports at the expense of sportsmanship:</strong> The best athletes keep their emotions in check and perform at an even keel, win or lose. Parents demonstrative in showing displeasure during a contest are sending the wrong message. Encouragement is crucial — especially when things aren’t going well on the field. <strong>• Having different goals than your child:</strong> Brown and Miller suggest jotting down a list of what you want for your child during their sport season. Your son or daughter can do the same. Vastly different lists are a red flag. Kids generally want to have fun, enjoy time with their friends, improve their skills and win. Parents who write down “getting a scholarship” or “making the All-Star team” probably need to adjust their goals. “Athletes say their parents believe their role on the team is larger than what the athlete knows it to be,” Miller says. <strong>• Treating your child differently after a loss than a win:</strong> Almost all parents love their children the same regardless of the outcome of a game. Yet often their behavior conveys something else. “Many young athletes indicate that conversations with their parents after a game somehow make them feel as if their value as a person was tied to playing time or winning,” Brown says. <strong>• Undermining the coach:</strong> Young athletes need a single instructional voice during games. That voice has to be the coach. Kids who listen to their parents yelling instruction from the stands or even glancing at their parents for approval from the field are distracted and can’t perform at a peak level. Second-guessing the coach on the ride home is just as insidious. <strong>• Living your own athletic dream through your child:</strong> A sure sign is the parent taking credit when the child has done well. “We worked on that shot for weeks in the driveway,” or “You did it just like I showed you” Another symptom is when the outcome of a game means more to a parent than to the child. If you as a parent are still depressed by a loss when the child is already off playing with friends, remind yourself that it’s not your career and you have zero control over the outcome. <strong>• Cheer everybody on the team, not just your child:</strong> Parents should attend as many games as possible and be supportive, yet allow young athletes to find their own solutions. Don’t feel the need to come to their rescue at every crisis. Continue to make positive comments even when the team is struggling. <strong>• Model appropriate behavior:</strong> Contrary to the old saying, children do as you do, not as you say. When a parent projects poise, control and confidence, the young athlete is likely to do the same. And when a parent doesn’t dwell on a tough loss, the young athlete will be enormously appreciative. <strong>• Know what is suitable to discuss with the coach:</strong> The mental and physical treatment of your child is absolutely appropriate. So is seeking advice on ways to help your child improve. 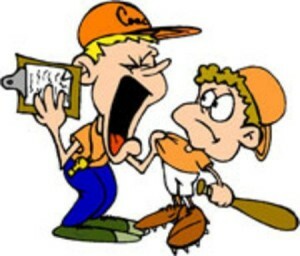 And if you are concerned about your child’s behavior in the team setting, bring that up with the coach. Taboo topics: Playing time, team strategy, and discussing team members other than your child. <strong>• Know your role:</strong> Everyone at a game is either a player, a coach, an official or a spectator. “It’s wise to choose only one of those roles at a time,” Brown says. “Some adults have the false impression that by being in a crowd, they become anonymous. People behaving poorly cannot hide.” Here’s a clue: If your child seems embarrassed by you, clean up your act. <strong>• Be a good listener and a great encourager:</strong> When your child is ready to talk about a game or has a question about the sport, be all ears. Then provide answers while being mindful of avoiding becoming a nightmare sports parent. Above all, be positive. Be your child’s biggest fan. “Good athletes learn better when they seek their own answers,” Brown says.